This is the final installment of a message given in May at the Pembroke Fellowship Church Mother/Daughter Banquet. To read the first three parts, click on the links below. The process will make you or break you. It will make you bitter or it will make you better. The pain and the process has a purpose. The ultimate purpose of your affliction is to see God and for you to look like Jesus. The purpose of the refining process is to teach you God’s principles. God wants to teach you a principle during your process. It was good for me to be afflicted so that I might learn your decrees. Psalm 119:71. You can wallow in pity or you can learn the principle. What are some principles God teaches you during the process? · The Lord will provide. · He hears our cries. · He’s close to the broken hearted. · Trust in the Lord with all thine heart. In all thy ways acknowledge him and he shall direct your path. · He has plans for me. Plans to give me a future and a hope. · Even if He doesn’t deliver me from this fiery furnace, God is able. He’s able to do exceedingly, abundantly, above what I can ask or think. · God is with me. · God is worthy of the praise, even in the press of the process. The process assures us of God’s presence and demonstrates His power. And then the purpose of the process is to give you a promotion. That’s why you don’t lose heart. Because the process comes with a promise. That’s why you don’t have to give up. Because your process will be complete. What God starts, He finishes. He completes. In fact, the Lord has already finished whatever He started because He is the Alpha and the Omega. The beginning and the end. On the cross, Jesus said, “It is finished. Process complete. Three days later he got up with all power in His hands. He was promoted because now he is sitting at the right hand of God, making intercession for us. Don’t lose heart. You can go through the process because Jesus went the process and He finished. You are valuable to God and He has a purpose for your life. God can’t shine through us until He has refined us. The purpose of the process is for you to reflect the light of the Son. Your brilliance comes from the Son, not the SUN, but the SON. The moon that shines so brightly in the sky at night is not really shining of its own power. It’s just a big rock. The moon is simply reflecting the sun’s energy and power. Philippians 2:13 says, “For God is working in you, giving you the desire and the power to do what pleases him.” The Message Bible puts it this way: That energy is God’s energy, an energy deep within you, God himself willing and working at what will give him the most pleasure. In the book of Revelation, John uses imagery to give us a picture of the New Jerusalem where God will live with His people. There will be no need for the sun or moon because God himself will be the light. The Bride, the wife of the Lamb, is described as a precious jewel. The Church, those who believe in the redeeming work of Jesus Christ and call Him Lord and Savior, is the bride of Christ. Jesus is the bridegroom. We are the bride of Christ. If you have not accepted Jesus Christ as your Savior, accept him today. Believe on him today so that you can live with God for eternity. If you’ve believed on him, don’t despise the process. Know that there is a purpose and He’s preparing you. He’s refining you. 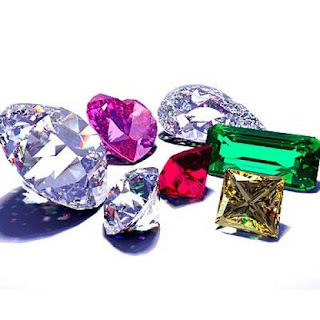 He wants his precious jewels to reflect his brilliance. So let your light so shine that others may see your good deeds and glorify your Father in Heaven. (Matthew 5:16).